✓ Professional Certified Translation. ✓ 100+ Languages. ✓ FREE Certification. ✓ Bilingual, Native Translators. ✓ Same Day Certified Translation. ✓ Money Back Guarantee. ✓ USCIS & Court Accepted. ✓ 24/7. Here at Certified Translation, we pride ourselves in providing fast, accurate and legal certified translation services. 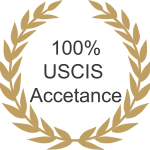 Certified translations are documents intended to be presented to official authorities, usually for legal purposes that are admissible in Courts of Law, to Schools, Police, Immigration (USCIS) or in other official capacities. We guarantee accuracy and money back guarantee. In addition, our team uses a number of techniques to eliminate the possibility of fraud, resulting in a translation that can be trusted by anyone, up to and including governmental bodies and academic organizations. Certified Translation is a global translation and interpretation agency in business for over 18 years. We have the experience and expertise to carry out any type of translation project in +100 commercial languages and all specialty field. Certification of a translation is the process when the translated document by a professional translator attests in writing that the translation has been translated accurately to the translator’s best knowledge and ability. This written “certification” may be obtained by the translator of the translations agency attesting and signing that this is the true and correct translation of the original document. We do not use machine translations. At a rate of $35 per page*, our translations are not only accurate and efficient, but they are also among the most affordable certified translation services available today. Free Certification and Notary Service, no hidden fees.